The Priests are not only committed to gather information and argue about the Tribunal's background, but they also seemed to actively compete with the Ordinators on how to effectively confront Dagoth Ur. According to their leader Gilvas Barelo, the Priests sensed the despair within the people of Vvardenfell. 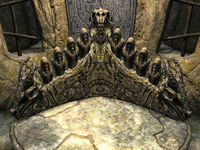 They followed a practical approach to which the common folk could look up and to spread hope by turning to the ancient pillars of faith and the prophetic visions of their Nerevarine. The Dissident Priests hoped for the Temple's and the people's support once they had shown their ability to confront Dagoth Ur efficiently.